﻿ Orchidees Hotel, Da Nang | FROM $22 - SAVE ON AGODA! "New, clean, big room, breakfast and staff very nice." "Bathroom was large with nice shower!" "The staff there are very very nice, helpful and friendly." 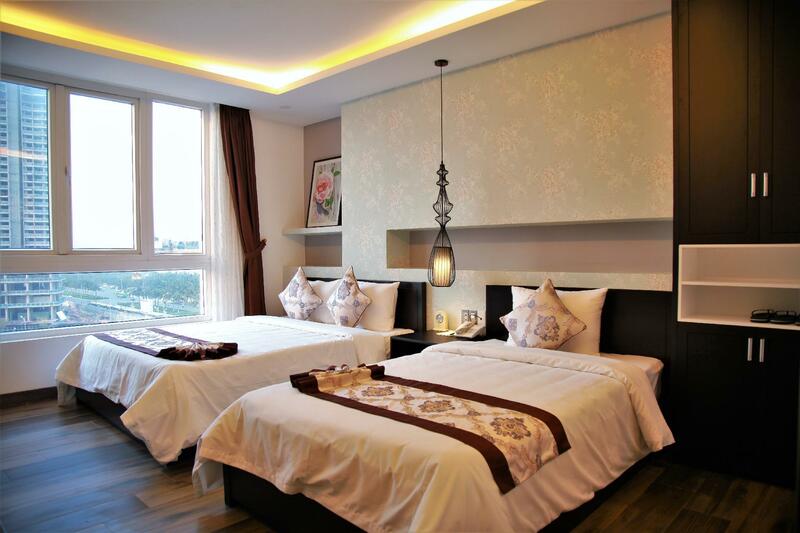 "Pros: Friendly, helpful, triple bedroom was very nice and co..."
For travelers who want to take in the sights and sounds of Da Nang, Orchidees Hotel is the perfect choice. Only 5km from the city center, the property's strategic location ensures that guests can quickly and easily reach many local points of interest. With its convenient location, the property offers easy access to the city's must-see destinations. Offering guests superior services and a broad range of amenities, Orchidees Hotel is committed to ensuring that your stay is as comfortable as possible. This property offers numerous on-site facilities to satisfy even the most discerning guest. Guests can choose from 47 rooms, all of which exude an atmosphere of total peace and harmony. The property's host of recreational offerings ensures you have plenty to do during your stay. Superb facilities and an excellent location make Orchidees Hotel the perfect base from which to enjoy your stay in Da Nang. "I will recommend this hotel as the staff are Super nice"
Only a few hundred meters from a world class beach,on a street bustling with food and shops. The staff ,front desk, breakfast. Housekeeping and others are all top notch. A little noisy with construction to the north, but overall a very good experience. Nice rooms, close to the beach. Friendly staff. Breakfast could be better though. The room is clean. Many restaurant nearby. Has bus no 12 to Big C supermarket and railway ststion. Pros - beautiful spacious room, strong wifi, good location Cons - tv not working in both rooms despite they managed to fix it on the first day after calling them few times but it didnt last long so eventually we gave up, unpleasant view as there was construction going on across the road blocking the beautiful beach view not to mention the unbearable noise up to 3am, the tiles in the bathroom are very slippery and dangerous when wet, no crockery provided except few glasses, teacups and a jug. Staffs proficiency in english is very poor. Had a really hard time communicating. First step we walk to this hotel. A littel girl polite greeted and carryed our 2 heavy big luagguests into hotel. The checkin process super fast. After that she tryied to recomment the sightseeing, local restaurant, famous seafoods restaurant and museum in danang. I look as her name tag is “Thu hoa” We visit the famous place in good time because her recommend. Once checkout her service very fast since I carry my luagguest to sofar area she told staff checking the my room with her memory without my information. Im feel very happy with her service. Before i leave she asking how am i feeling with there service. I feel totally happy and i will come back for sure. Once i stay in the hotel the sky bar and swimming pool on 12fl are on renovate. The location is nice near the beach and mart also seafood and local food. Banh mi in front of hotel is delicious. New, clean, big room, breakfast and staff very nice. Noisy due to construction and traffic. Staff is helpful but limited to go beyond to help Customer. Room; dirty wall, blankets is Dirty Breakfast; cold food, limited selection. The guy cooking the egg. Is like end of the world for him or something. Swimming pool is off limit due to constructions. Pros: Friendly, helpful, triple bedroom was very nice and comfortable. Breakfast was Ok, but I am very picky! Bathroom was large with nice shower! Cons: none. Hoa was very nice with us and all staff were too. Very good stay. Just add some pork meat in the breakfast and itwill be perfect ! The hotel was clean, the staff was really nice and helpful. Unfortunately the jacuzzi was not working. Breakfast was okay, lots of Vietnamese breakfast food but also toast, jam, eggs and fruits available. All in all we would recommend the hotel! 형편없는 숙소 대비 가격이 너무~ 비싸다 ! 여자 2명에 남자 1명이 가서 방 하나를 예약했는데 방에 룸이 2개 있는 방으로 업그레이드를 지켜주었습니다. 위치도 비치랑 가까워서 매우 좋았고 숙소도 상태가 좋았습니다. 하지만, 조식은 음식이 없어도 잘 채워지지 않았고 재료가 없어서 먹지 못한 것들도 있었습니다. 한꾺인뜰 쩔떄 이꽀예 예앾하찌맑쎼여 쑤껀옌항쌍무었이 묻얽있꼬 쭝꾺인뜰이 뜪씱댑니다.왉익팕위는 쩐혀 안뙤니 없딹고썡깎하쎼여. 풀짱따윈 끼떌할찎또 마쎼여.